where Q\\ = (WJWcl)LE\s as Wy < Wcl, or Q\\ = LE\S as > Wcl is the latent heat flux at the land surface in the southern box; E\s is the potential évapotranspiration; R1 is the run-off referred to a unit area of the land surface. where sj" = (sit + Si2) is the land area in the southern box. To estimate s5', and s\2 we assume that the land area s2 in the northern box falls to the Arctic Ocean watershed only. Since the total area sA of this basin consisting of and s2 is known, then s^ = sL — sA, Sj2 = sA — s2, where it is assumed that s2 < sA. Substitution of these relations into (5.5.30) yields the final expressions for the determination of R11 and R12 by the value of R1 obtained. where M^ = pshss2 is the mass of snow at the land surface in the northern box. Ts is the annual mean temperature of the land surface in the northern box; hh is the thickness of the active land layer in this box; AL is the soil thermal conductivity. It is assumed that the spring high water ends at the moment when the snow mass Ml at the land surface in the northern box vanishes. 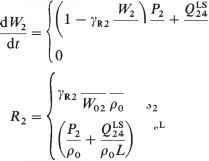 ;= i where Qs = (Ts — Ts)(hL/XL)~1 is the heat flux in the active land layer. It remains to determine the areas of the northern and southern boxes. We assume that the boundary between them coincides with the annual mean isotherm —4.5 °C, which location is defined by the approximation of the meridional distribution of the annual mean surface air temperature by the first two terms of the series in even Legendre polynomials. The last condition, together with (5.5.1)—(5.5.35), forms a closed system to estimate all the climatic characteristics of the Northern Hemisphere that we are interested in. We now begin discussion of the results of a numerical experiment on the simulation of natural seasonal variability (Figures 5.5-5.7). As can be seen, the qualitative features of the seasonal variability of the climatic system in the Northern Hemisphere are reproduced correctly. In particular, we note a phase shift between air and land surface temperature variations in the northern and southern boxes, and also between water and air temperature variations in both boxes; the absence of marked seasonal variations of water temperature in the area of cold deep water formation, and in the DOL, and their presence in the UML in the upwelling area; a decrease in duration of the period of heating and an abrupt increase in convective heat exchange at the ocean surface during the cold half of the year in the area of cold deep water formation; an increase in amplitudes of seasonal oscillations of the surface air temperature and land surface temperature in the northern box compared with their values in the southern box; an increase in the atmospheric moisture content in summer and its decrease in winter; a phase shift between oscillations of evaporation from the land and ocean surfaces in the southern box that is connected with the delay in timing of maximum and minimum values of the sea surface temperature; a significant seasonal variability in evaporation in the area of cold deep water formation; an increase in precipitation in the southern box accompanying an enhancement of local evaporation; an opposite change in precipitation during the warm half of the year in both boxes and, as a consequence of a summer decrease in evaporation, the appearance of spring and autumn precipitation maxima in the northern box. Figure 5.5 Seasonal variability of the thermodynamic cycle characteristics in the 0.5-dimensional box model of the climatic system, according to Kagan et al. (1990); (a) the net radiation flux at the upper atmospheric boundary in the southern (1) and northern (2) boxes, circles are experimental data from Stephens et al. 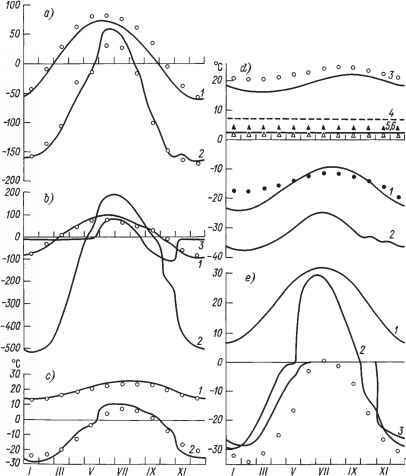 (1981); (b) the resulting heat flux at the ocean-atmosphere interface in the upwelling area (1), in the area of cold deep water formation (2), and in the polar ocean (3), circles are data from Strokina (1982); (c) the surface air temperature in the southern (1) and northern (2) boxes, circles are data from Warren and Schneider (1979); (d) the mass-weigh ted average air temperature in the southern (1) and northern (2) boxes, the water temperature in the UML (3) and deep layer (4) in the upwelling area, in the area of cold deep water formation (5), and in the deep layer of the polar ocean (6), the solid circles are data from Oort and Rasmusson (1971), the open circles are data from Strokina (1982), the triangles are data from Stepanov (1974), solid triangles are in the deep layer of the upwelling area, open triangles are in a zone of cold deep water formation; (e) the land surface temperature in the southern (1) and northern (2) boxes and sea ice surface temperature (3) circles are data from Untersteiner (1961). 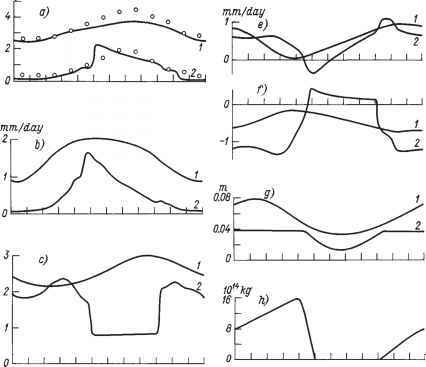 humidity in the southern (1) and northern (2) boxes, circles are data from Oort and Rasmusson (1971); (b) evaporation from the land surface in the southern (1) and northern (2) boxes; (c) evaporation from the ocean surface in the upwelling area (1), and in the area of cold deep water formation (2); (d) precipitation in the southern (1) and northern (2) boxes, circles are data from Jaeger (1983); (e) the precipitation-evaporation difference at the land surface in the southern (1) and northern (2) boxes; (/) the precipitation-evaporation difference at the ocean surface in the upwelling area (1), and in the area of cold deep water formation (2); (g) the soil moisture content in the southern (1) and northern (2) boxes; (h) the snow mass at the land surface; (i) the run-off in the southern (2) and northern (1) boxes. Figure 5.7 Seasonal variability of sea ice characteristics in the 0.5-dimensional box model, according to Kagan et al. (1990); (a) ice area; (b) ice thickness; (c) thickness of snow cover (solid curve), and of melted water (dotted line), solid and open circles are data from different sources. precipitation and evaporation on the land, and a negative difference in the ocean, leading to closure of the hydrological cycle. By the way, the minimum values of this difference on the land of the northern box fall in summer due to decreasing precipitation and increasing evaporation, and on the land of the southern box these minimum values fall in spring, mainly due to increasing evaporation. We also point to the fact that the soil moisture content in high latitudes, as would be expected, is less than its critical value only during the warm half of the year (after snow melting) and that in the southern box it is subjected to more distinctive seasonal oscillations with minimum in summer and maximum in winter. The run-off in the southern box is subjected to similar changes, with variations of the precipitation-evaporation difference and run-off shifting with respect to each other by two or three months. As a result, maximum run-off in the southern box occurs at the end of February, and minimum run-off occurs in the middle of July. The seasonal change of run-off in the northern box contains two maxima. One (the spring maximum) is caused by intensive snow melting, the other (the autumn maximum) is caused by a precipitation increase. Results of calculations also reproduce the asymmetry of the seasonal change in the area and the thickness of sea-ice, the complete disappearance of snow in summer and the phase shift between variations of the sea ice area and air temperature. Figures 5.5-5.7 illustrate the degree of agreement between calculated and observed values of the climatic characteristics. As can be seen, satisfactory agreement cannot be reached for all of them. So, the amplitude of seasonal oscillations of the mass-weighted average air temperature TA in the southern box turns out to be twice as large as the observed value, and the amplitude of seasonal oscillations of specific humidity q in the same box is only two-thirds of the observed value. Overestimation of the amplitude of oscillations of Ta is likely to be connected with prescribing constant cloudiness throughout the year; meanwhile underestimation in the amplitude of oscillations of q is probably due to application of the condition of instantaneous precipitation of moisture excess. By the way, underestimation in the oscillation amplitude of q leads to overestimation of precipitation and latent heat of oscillation amplitudes and, therefore, it is one more cause of overestimation of the oscillation amplitude of TA. But it should be remembered that the basic variable in the model is the surface air temperature Ta, seasonal oscillations of which are reproduced quite satisfactorily: maximum discrepancies between calculated and observed values of Ta occur in August and amount to about 1.5 °C. Considerable discrepancies are also inherent characteristics of sea ice during the warm half of the year. 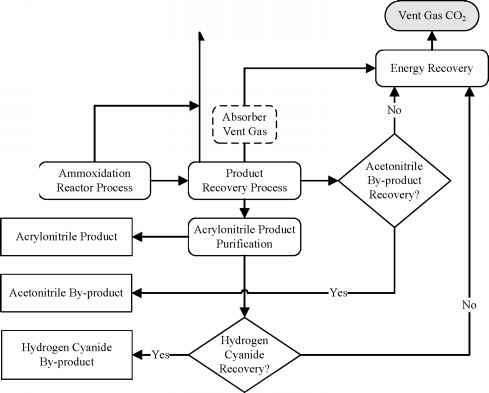 This is connected with the limited potential of the model, which does not allow for the appearance and disappearance of leads and the drainage of melted water. At the same time, agreement of calculated and observed annual mean values of the area, thickness and export of sea ice turns out be satisfactory: according to calculated results the annual mean sea ice area amounts to 12.0 x 106 km2, thickness 2.72 m and export 0.18 x 106 m3/s, while from the observational data they are equal to 11 x 106 km2, 2.7 m and (0.1-0.2) x 106 m3/s respectively. A similar conclusion can be made in regard to the run-off into the ocean. According to the calculated results the annual mean run-off into the oceans of the Northern Hemisphere normalized to the unit area of land, and the annual mean run-off in the Arctic Ocean normalized to a unit area of land in the northern box, amount to 20.5 and 42.4 cm/year. The experimental data yield 22.022.4 cm/year and 30.2 cm/year respectively. We should mention in particular the estimate of the heat transfer into the atmosphere in the area of cold deep water formation. In winter, according to calculated results, it can even exceed the value of the absorbed solar radiation flux. Indications in favour of the existence of very large values (up to 500-600 W/m2) of heat transfer into the atmosphere can be found in Killworth (1983). An ideologically similar box model of the climatic system was proposed by Harvey and Schneider (1985). This differs from the one discussed in the rejection of the description of the hydrological cycle and sea ice, the fixing of temperature in the area of cold deep water formation, the prescribed seasonal change in the UML thickness in the upwelling area, the replacement of the mixed DOL by a layer where the vertical temperature distribution adheres to the condition of local balance between the vertical heat diffusion and the vertical ordered heat transport and, finally, in the approximation of the vertical diffusion coefficient and upwelling velocity by some prescribed functions of the vertical coordinate. These and similar assumptions impoverish the model in the sense of accounting for different feedbacks regulating the behaviour of the climatic system, but they do allow us to carry out a great number of numerical experiments for little cost. Let us agree that each model has its own advantages and a great deal, if not all, depends on the way that we use these models. One of the shortcomings of the box models, as well as of the one-dimensional models, is the assumption that the meridional heat transport in the atmosphere is realized only by quasi-two-dimensional turbulence of synoptic scale parametrized with the help of the diffusive approximation being constant or variable depending on the local meridional temperature gradient coefficient of horizontal diffusion, and in the ocean by quasi-two-dimensional turbulence and ordered motions comprising the meridional circulation cell. Let us show that there is one more mechanism of the meridional heat transport in the ocean. We define the meridional heat transport MHT0, as well as the meridional component of the current velocity vQ and water temperature T0 in the ocean, as where /¿is the ocean fraction in the zonal belt of unit meridional extent; cG is the specific heat of sea water; mQ is the mass of a water column of unit cross-section; the symbol , the square brackets and the asterisk mean averaging over depth, zonal averaging and departure from zonal averaging respectively.